If you are planning to have a hardwood floor or laminate floor installed it is imperative to first have the subfloor moisture tested. Moisture testing should be done whether the subfloor is wood or concrete. Subfloor moisture testing determines if the subfloor contains too much moisture for hardwood or laminate floor installation. Installing a hardwood floor or laminate floor on a subfloor with too high of a moisture content is a ticket for cupped and warped flooring. Asking potential flooring contractors if they first perform subfloor moisture testing is an excellent screening question. If they say no, find another flooring contractor. Hardwood and laminate flooring costs too much to have it installed improperly, and good luck trying to get them back to repair it, or warranty it, months after the floor begins to show signs of moisture damage. Subfloor moisture testing is performed with a hand held meter than can measure the subfloor’s moisture content. Some moisture level testers can test various types of material, e.g. wood, concrete, and even drywall for percent moisture content levels. They are expensive however, and thus probably not worth the homeowner purchasing one to perform the test him or herself. However the flooring installation contractor should have a moisture level tester and should use it to determine if the subfloor is viable for installing the hardwood or laminate flooring. If the subfloor moisture test results show too high of a moisture level then the subfloor should be dried out before installing the hardwood or laminate flooring. The maximum level of moisture level in the subfloor that is acceptable depends upon the hardwood floor or laminate floor manufacturer’s installation recommendations. In general, however, the National Wood Flooring Association suggests a maximum allowable moisture level in the subfloor of 4-18%, depending upon the species of wood and local climate. Also important is the difference in moisture levels between the subfloor and the to-be installed hardwood floor or laminate floor material. Again, installers should rely on the manufacturer’s recommendation however the maximum difference should not exceed 4%. For concrete subfloors there is a simple and low cost moisture test that homeowners can perform. Simply tape down in several locations around the concrete floor, 3”x3” patches of clear polyethylene plastic. After 2 days, check the plastic patches for the formation of condensation on the side facing the concrete. Also check the concrete floor under the patch for any discoloration. If you see any of these symptoms, then you know you have a moisture problem. You should address this problem prior to installing hardwood or laminate flooring. When installing hardwood and laminate flooring it is important to allow the new hardwood or laminate flooring material to acclimate to the local humidity level of the room prior to being installed. 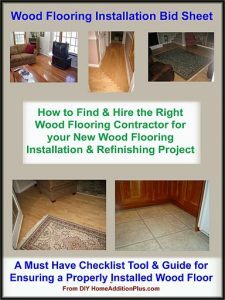 Use this wood flooring installation checklist and save time and money on your wood flooring install. To do this, the hardwood or laminate flooring should be stored in the room 2 or 3 days prior to the actual installation. Not only will this help make the flooring installation process go smoother, it will also help to minimize the likelihood of future cupping, warping or gaps to form in the flooring.